If you've ever tried to rent a bike in NYC you know it can be an expensive pain in the $#!@%. Thankfully, New York City will soon be a lot more bikeable. Mayor Bloomberg and the city's Department of Transportation yesterday announced plans for an ambitious bike-share program, which is slated to launch in Summer 2012. Portland-based Alta Bicycle Share has been selected to run what is expected to become the largest program of its kind in the country, and one of the largest in the world. Like similar programs in other cities, the bike-share program will be entirely funded through membership fees and corporate sponsorship. 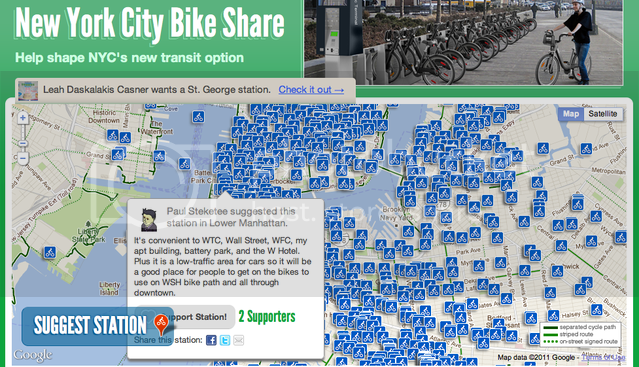 To that end, the city has been circulating a sponsorship deck, hired a media valuation analysis and set-up a website, NYCBikeShareSponsorship.com, to field sponsorship inquiries. Barclays currently pays £5 million per year over a five year term to sponsor London's bike share system, while Rio Tinto Alcan, which makes aluminum for the construction of bicycles, title sponsors Montreal's popular BIXI bike share program. Lest sponsors think that they would have to wait a full year to activate the program, many initiatives are already ongoing as the program gets kicked into gear. For example, DoT is using social media to crowdsource ideas for where the bike share stations should be located throughout Manhattan and Brooklyn. Exclusive association to the full program. The entire system branded to your product. Visibility on bikes and docking stations. Exclusive tailored activations & promotional possibilities. PR angles that will last for years. The city is looking for a maximum of four sponsors for the program. Any good ideas for which brands would be in the best position to sponsor and/or activate New York's new bike-share program?